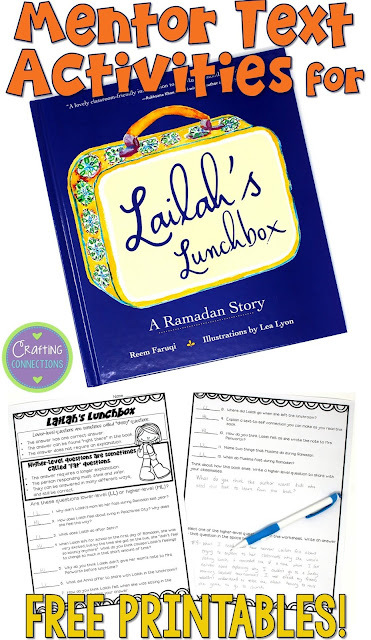 A quick summary: The book begins the day before Ramadan, when Lailah hangs up her lunchbox because she won't be needing it for the next month. Lailah and her mother are both thrilled and proud that she has reached this special milestone in her life. However, the next day her excitement quickly turns to anxiety, as she worries about what exactly will happen during lunchtime when she is the only student who doesn't eat lunch. She finds herself wishing she could return to Abu Dhabi, her old home where her best friends would also be fasting for Ramadan. When lunchtime arrives, Lailah is still too scared to give her teacher the note her mother wrote, and she heads to the lunchroom with her classmates. A few thoughtful classmates volunteer to share their lunches with Lailah, but she is too nervous to explain why she doesn't accept their offer. Finally, she sneaks out of the cafeteria and heads to the library, where she explains everything to the librarian. Mrs. Carman encourages Lailah to write down what she is feeling, and Lailah proceeds to write a letter to her classroom teacher, along with a poem about Ramadan. She drops it on her teacher's desk before she leaves school. The next day, Lailah's anxiety returns. However, her teacher hands her a message that invites her to visit the library instead of sitting in the cafeteria during lunchtime throughout Ramadan. Her teacher also invites Lailah to share her poem with the class later that day. Lailah is relieved that she doesn't have to endure lunchtime in the cafeteria, and she is excited about sharing her poem with her classmates. Teachers know that asking higher-level questions is extremely important. When students are required to answer open-ended questions related to the books they are reading, they achieve a deeper understanding that results in advanced cognitive and emotional responses. Furthermore, I have found that it is helpful for students to understand the differences between lower-level questions and higher-level questions. Not only does this knowledge prepare students for when they are asked a higher-level question, but it also prepares them to independently participate in book clubs and literature circles in a way that has meaningful results. 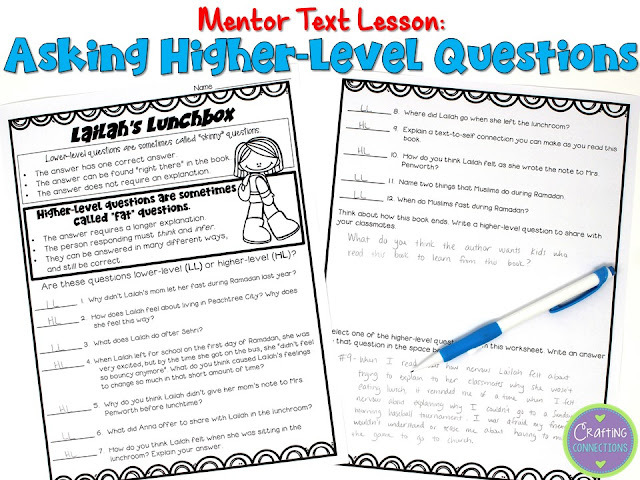 Feel free to download the free worksheet that I created to accompany Lailah's Lunchbox. First, I intend to read aloud the book for pure enjoyment. When I finish the book, I will say something like "Wow, this book has given me a lot to think about. When I read books like these, I like to discuss it with others to find out if they feel the same way I do, or if they feel differently. 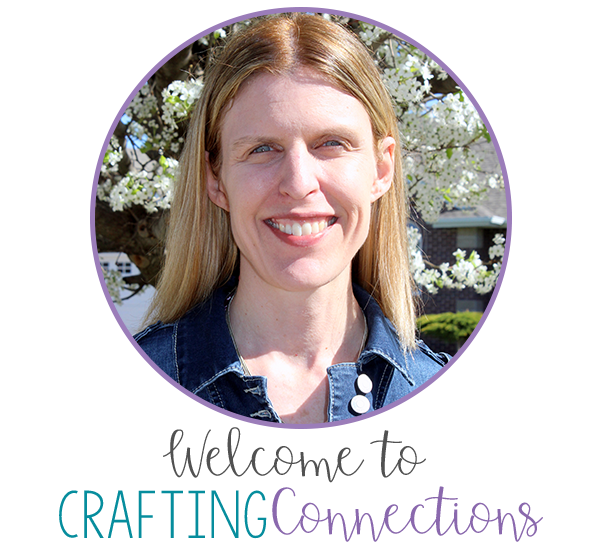 In order to have a book discussion, though, it is helpful to plan the questions you want to ask." Then, I will distribute the worksheet and tell students that we are going to review a list of questions that were written about the book we just read together. After discussing the content in the top two boxes, I will ask students to consider which questions are most conducive to a book discussion (Higher-level questions are more helpful because they allow for more discussion.) Next, I will give students about 5 minutes to complete the worksheet. When everyone has finished, we will go through the questions together, labeling them as higher-level or lower-level questions. Finally, I will divide the students into small groups and have them share the questions and answers they wrote for the final two items on the worksheet. Thank you for stopping by today! Be sure to hop around and visit my friends' blogs and check out the other diverse books shared in this mentor text link up! Thank you for this thoughtful resource! I cannot wait to share it with my students during Ramadan! I love this! As a teacher of gifted students, I'm always looking for ways to get them to think more deeply and having them write their own questions is one of those ways. 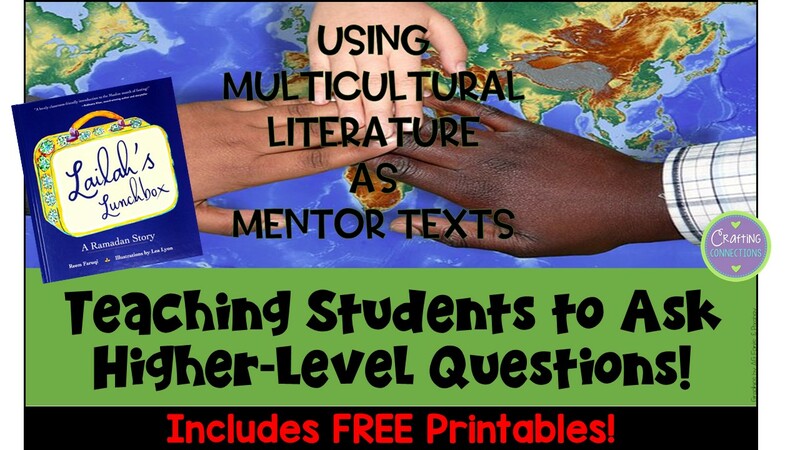 This is the perfect resource for helping them with that skill, AND for exposing them to a multicultural text in the process. Thank you so much for sharing!